The park is on the western edge of the Seven Mountains in northeastern Huntingdon County, an area of rugged beauty, abundant wildlife, breathtaking vistas, and peaceful solitude. Greenwood Furnace State Park covers 423 acres, including a six-acre lake, campground, hiking trails, and a historic district. The park provides access to backpacking, hiking, mountain biking, hunting, and fishing in the surrounding 80,000-acre Rothrock State Forest. The furnaces were hot (3,000 degrees Fahrenheit) and cast clouds of smoke and cinders into the air, which rained down on grass, people, livestock, and buildings; rendering everything sooty and gray. At night, the fire’s red glow lit the sky, probably allowing residents to walk about without lanterns. 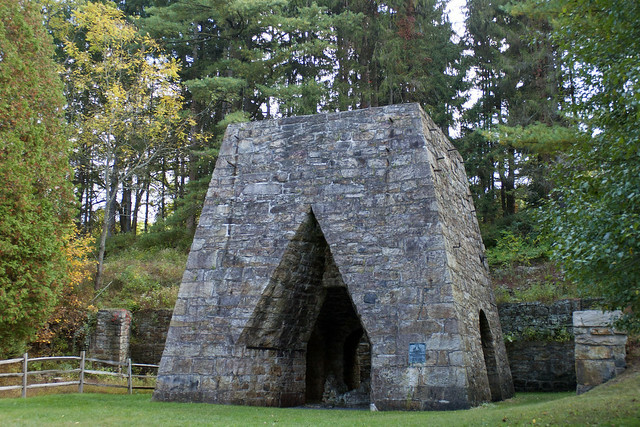 Greenwood Furnace was a village built around an inferno. The park office is open from 8:00 A.M. to 4:00 P.M., Monday through Friday. The beach, overnight areas, and other areas are open specific seasons and hours. Contact the park office for facility seasons and hours. Greenwood Furnace State Park is along PA 305, about 5 miles west of Belleville and only 20 miles from Lewistown, Huntingdon, and State College. A food and refreshment concession near the beach serves visitors in the summer from Memorial Day to Labor Day weekend. Greenwood Furnace offers educational and recreational programs year round. Archeological work and extensive research have done much to uncover the hidden remains of the community. Guided walks, living history, and evening programs interpret much of the natural and historic resources of the park. Programs for school and civic groups are offered by appointment. School programs are custom-tailored to meet the teacher’s educational needs. PA Act 48-credit teacher workshops are offered. Contact the park office for details. Greenwood Furnace was once a thriving ironmaking village. Today, only a handful of its original 127 buildings remain. The walking tour explores a portion of the historic district, and includes parts of the town, tramway, historic roads, and charcoal hearths. A free guide to the historic district is available at the park office. This furnace-era building houses displays on the ironworks and serves as a base for many of the park’s educational programs. It is open weekends and holidays in the summer months. In the park office, the visitor center is open Monday through Friday most of the year, and daily in the summer months. The visitor center has displays on the former ironmaking community. The gift shop sells a variety of items, including T-shirts and sweatshirts, park memorabilia, historical and nature books, children’s nature books, and a variety of field guides for the novice and serious wildlife watcher. Proceeds benefit Pennsylvania state parks. This festival is held the first weekend in August in commemoration of the original “Old Home Day” reunion in 1921. It features events centered on life in the iron furnace community. The Huntingdon County Arts Council organizes this summer event which includes concerts, jam sessions, and musician workshops. Held the first Sunday in December, this event features kids crafts, carriage rides, and an antique toy display. Held in mid-January, this festival focuses on outdoor recreation and features the Juniata Valley YMCA “plunge” fundraiser. Visitors also enjoy a trail run, ice skating, broomball, snowshoeing, a concession stand sponsored by the Friends of Greenwood Furnace, and a variety of educational programs.